Scene 1: 'The palace and gardens of T'so-Ling', image courtesy of Lucienne Fontannaz and Ian Howard. These two beautifully designed, elegant books are the result of successful collaboration between Sydney-based husband and wife team Ian Howard and Lucienne Fontannaz. 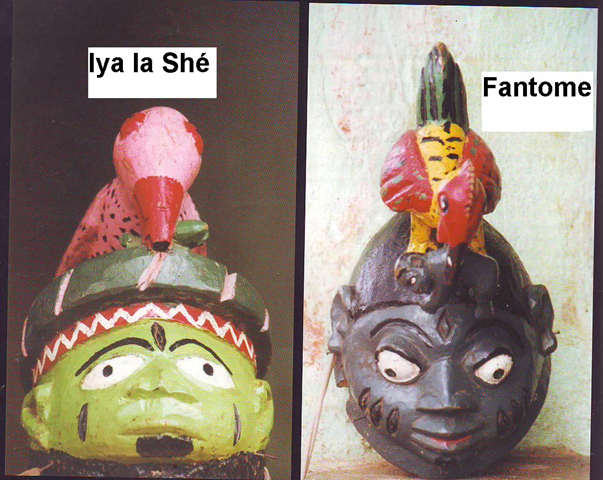 Ian Howard is an artist, academic and writer, while Swiss born Fontannaz is an artist, writer, curator and translator, whose deep, long-term research into the narratives, myths and legends of diverse cultures has led her to publish widely in the area. 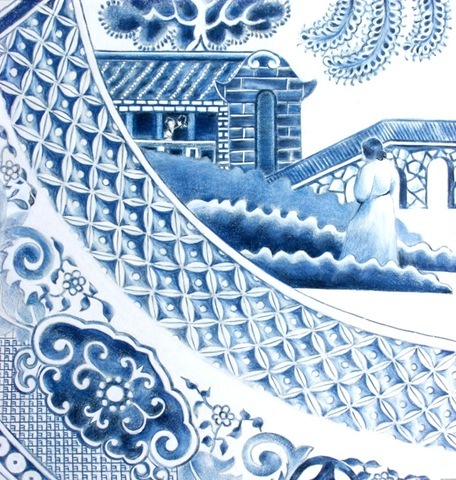 Fontannaz’s abiding fascination with the willow pattern and its attendant rather complex narrative has its origins in her childhood in Switzerland, where her parents were the owners of a willow pattern tea set. 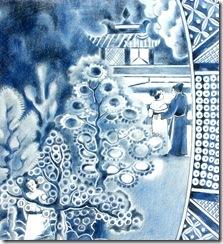 The francophone family referred to the willow pattern as ‘le motif chinois’ (‘the Chinese motif’). As a small girl Lucienne, entranced by its distinctive patternings, began making her own drawings ‘directly from the plates’. 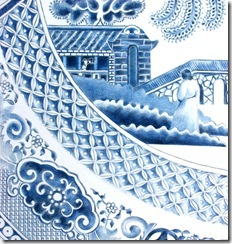 As she grew up and began travelling around Europe, she became aware of the ubiquity of crockery featuring the dominant blue and white of the willow pattern. “It was as if all the places I visited, grand and humble”, says Fontannaz, “had somehow been visited earlier by this curious design, linking them all”. Scene 2: The summer house, image courtesy of Lucienne Fontannaz and Ian Howard. 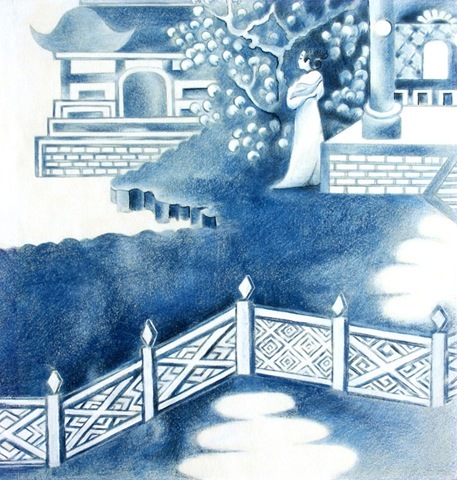 Scene 3: A new perimeter fence, image courtesy of Lucienne Fontannaz and Ian Howard. Soon after Fontannaz met Ian Howard in Montreal for the first time, he asked her whether or not she knew of ‘the Willow Pattern’. Replying that she did not, later on the same afternoon Ian Howard presented Lucienne Fontannaz with a cup and saucer. 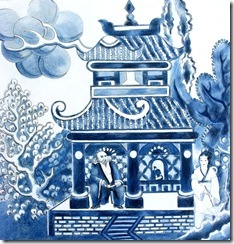 Astonished, she recognized that the ‘willow pattern’ on her prospective husband’s gift was one and the same as ‘le motif Chinois’ of her European childhood! 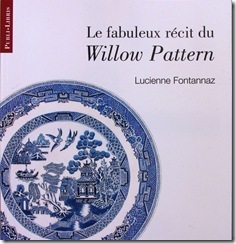 Fontannaz illustrated her first book on the willow pattern more than thirty years ago. That book, with text written by the distinguished Barbara Ker-Wilson and published by Angus and Robertson in Sydney in 1978, is now out of print. Nonetheless it is evidence of the enduring nature of Fontannaz’s enthrallment with the visual elements of this celebrated design and the tragic story underlying it. 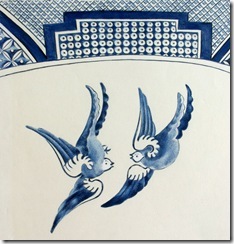 Very well known in England where it was created more than two centuries ago, this blue and white design, mainly seen on tea sets and dinnerware, is also known to many individuals and cultures around the world. 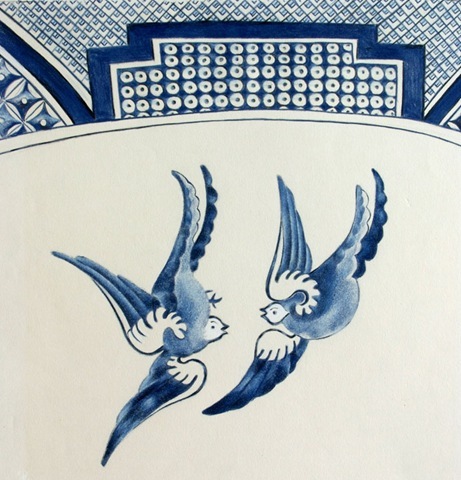 The popular success of the design has led to its being applied to a range of other objects, such as tea towels, greeting cards…folding screens and even textiles for soft furnishings. 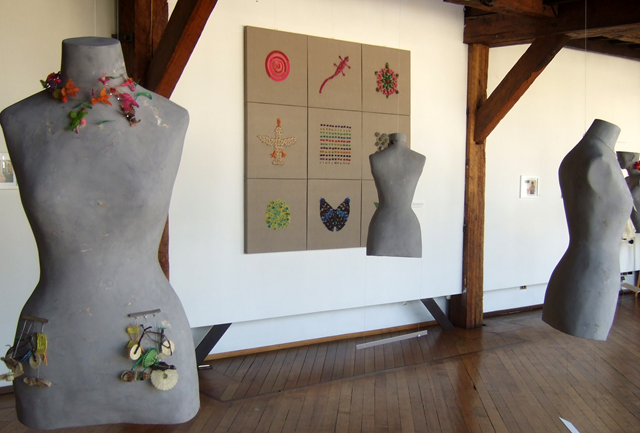 In recent years individual artists have incorporated the design, in whole or in part, into their paintings, collages, sculptures and ceramics. 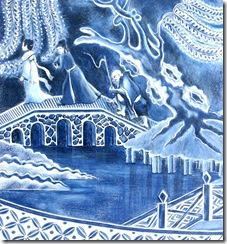 This is an indication of the widespread and deep cultural significance the Willow Pattern has as a contemporary motif”. Fontannaz goes on to detail the history of the design, including the seventeenth century English passion for ‘chinoiserie’; the surprisingly low cost of importation of fashionable Chinese porcelain from Jingdezhen and elsewhere in China to England and Europe at that time; the various factors that led English potteries to mass produce appropriated Chinese designs and to create their own ‘oriental/ist’ motifs, particularly the Willow Pattern; the British use of transfer printing and the associated use of the distinctive cobalt blue colour in the willow pattern; the manufacturers’ eventual branching out into different colour schemes including brown and red; and the uncertain origins of the narrative accompanying the design. Scene 7: The great escape, image courtesy of Lucienne Fontannaz and Ian Howard. Scene 8: Young fugitives in hiding, image courtesy of Lucienne Fontannaz and Ian Howard. 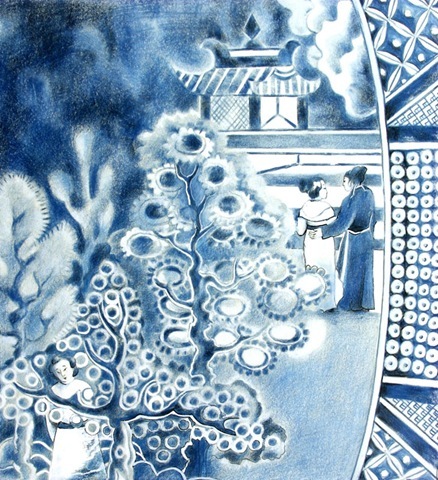 In addition, Fontannaz provides expert guidance in interpreting the individual graphic elements of the willow pattern, beginning with the pagoda on the right hand side of the plate, and continuing in a clockwise direction to the top where two white doves, representing the doomed lovers, signify the end point of the narrative. There is also some discussion about the genealogy of specific elements in the pattern (for example, the plates’ borders are definitely British) and further speculation about the genealogy of the narrative itself. 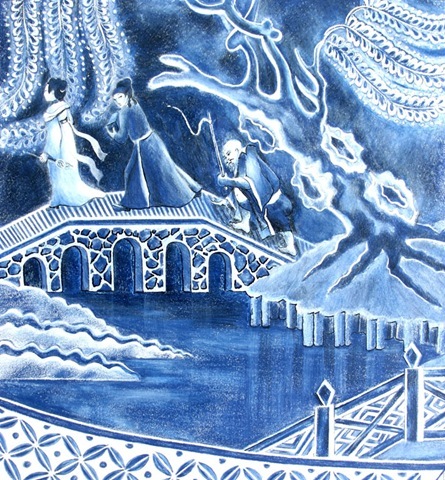 What becomes clear is that this complex history involves a plurality of eastern and western influences that converge and co-exist in the graphic elements of the willow pattern itself and its associated story. That such cultural diffusion was occurring before the advent of mass globalization makes it even more remarkable as a transnational phenomenon. 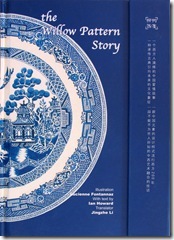 The balance of both books is devoted to Ian Howard’s lucid retelling of the successive episodes that collectively comprise the willow pattern story, complemented by Lucienne Fontannaz’s marvellous illustrations. Fascinatingly, in his account of the sad story about two star-crossed lovers, Ian Howard identifies a surprisingly contemporary environmental theme, relating to the critical role played by the weeping willow tree in the unfolding drama. Howard also draws attention to the importance of nature in more general terms, and its capacity either to obstruct or to further – as happens in this case – human endeavour. His re-interpretation not only convincingly places the narrative in the context of the present, giving it greater contemporary relevance and resonance, but it is also an inspired touch. Scene 13: Revenge, death and sacrifice, image courtesy of Lucienne Fontannaz and Ian Howard. Both books are strongly recommended. They would make excellent gifts for persons of either gender, especially because the pattern itself is so well known while by contrast, the ‘story within the story’ is relatively unfamiliar. 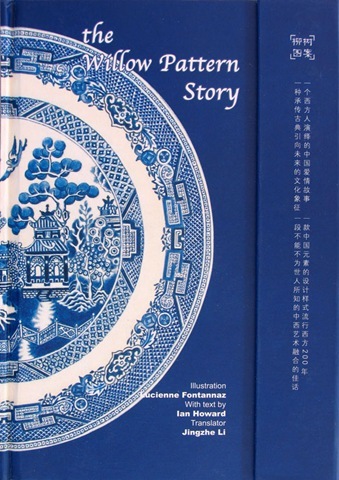 The broad cultural reach of both the willow pattern imagery and the accompanying narrative also makes these books perfect gifts for overseas associates, friends or visitors. The recent UNESCO World Forum on Culture and Creative Industries celebrated the link between fashion and craft practice. 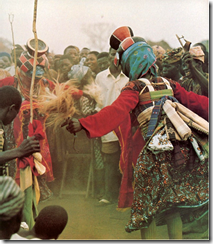 A consistent theme was the dependence of fashion designers on good artisans. But here lies the problem. 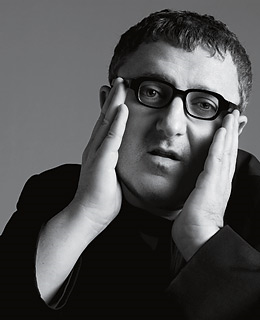 On the opening day, the Artistic Director for Linvin, Alber Elbaz confessed that he was worried that his specialised workers were getting old and there was no one to replace them. His otherwise enchanting talk left this question dangling: ‘Who would want to be a seamstress these days?’ Good question. So how can these positions attract a new generation? One possibility is to make them less anonymous. They could be featured in the company’s website and perhaps even mentioned on the label. It was suggested that this might be in the form of ‘the credits at the end of the film’. Maybe, but what about at the beginning of the film, where we would normally find the names of leading actors after the director? An alternative strategy suggested by Francoise Riviere at the end of the forum was to offer scholarships for craft practice. Both would be nice. Elbaz also emphasised the importance of stories in design. This loomed as one of the principal challenges for craft today – to find ways of conveying its meaning in an engaging manner. 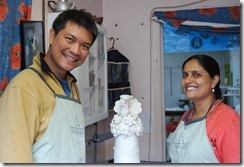 This would a useful workshop, don’t you think – the narrative basis for craft? In the end, the forum participants seemed particularly inspired by the Colombian Minister of Culture, Paula Moreno. Moreno argued for recognition for the South, not as an exotic attraction, but as equal. Her call that ‘culture is a history of the future’ was quoted many times by the end of the forum. So, the forum represented a unique platform for crafts on the world stage. The challenge now is to use this momentum to launch programs that can address issues like anonymity, narrative and sustainable links to industry. We certainly recognise that our future needs the history of craft. Good design must be well-made. We need to acknowledge those whose skills make things possible. 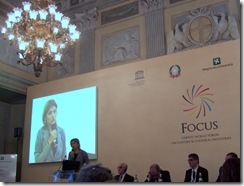 The first UNESCO World Forum on Culture and Cultural Industries occurred at Monza, near Milan, 24-26 September. It brought together around 200 participants from areas of fashion, business, politics, design and craft. There were a broad diversity of nationalities, with strong representations from Italy, France, Uruguay, South Africa. As the only representative from the Pacific region, I felt a little isolated initially, but soon found strong connections particularly from other countries of the south. The event was well-organised, strategic, relevant and in particular, provocative. Cultural industries, notably in the areas of design and fashion, embody a continuum between traditional inspiration, the fruit of identity, and modernity. They would benefit from being more deeply rooted in traditional know-how. 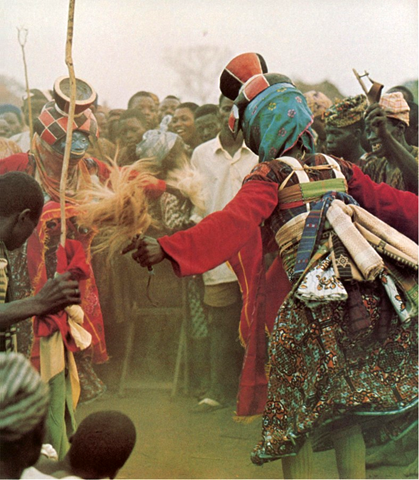 Cultural industries must be able to give life to and be nourished by know-how through adapting to a changing world. In so doing, they can embody a constant dynamic of renewal. 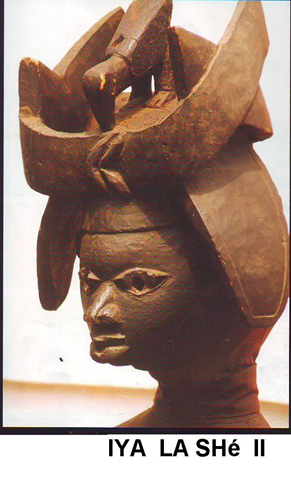 This move towards the private sector a shift from the focus that many associate with UNECSO, which would be to work with state institutions such as museums and universities to sustain traditions. Previously, the operations of the capitalist market would have been seen as a threat to cultural heritage. Not so today. This link between culture and business has become a familiar conversation in Australia, so how does it sound on the global stage? Given the support of its hosts, it is understandable that the Italian perspective was strongly featured in the forum. The Italians have much to gain by associating their products with their cultural heritage. This gives them an obvious edge over countries like China, particularly in luxury brands. It was surprising to see how strongly craft figured in this. In the opening session, Sandro Bondi the Italian Minister for Cultural Heritage and Activities spoke of the close link between the handmade and an aesthetic sensibility. Roberto Formigoni, the President of the Lombardy Region, saw craftsmanship as the essential basis for successful industrialisation. Complementing this were some high-powered presentations from business consultants about ways of marketing craft. Tom Pigott, the CEO of BrandAid, spoke about their pilot project in Haiti, where they recruited Hollywood celebrities to support local metalsmiths. 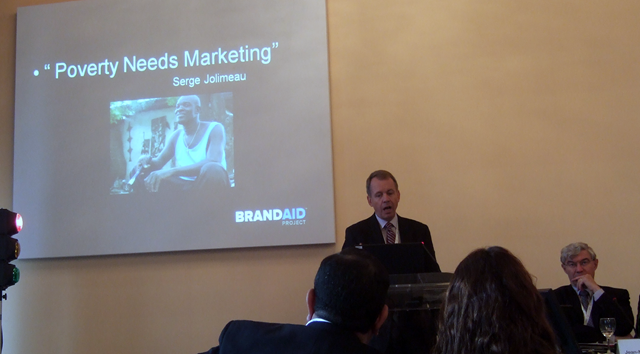 He made the emphatic point that ‘Poverty needs marketing’. This was one point that warranted critical reflection. It’s a curious statement, when you break it down to its components. 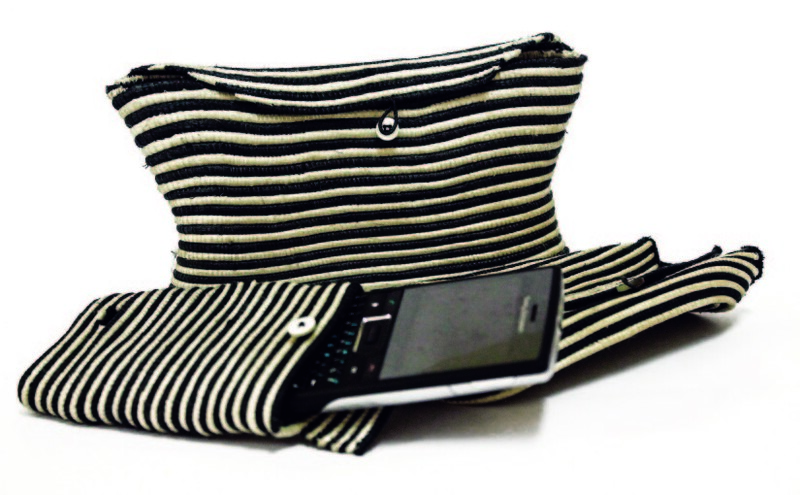 The implied aim is to improve the standard of living for artisans, so their craft can flourish. One way to do this is to sell their very impoverishment as something attractive, particularly to consumers whose only real lack is lack itself. Yet, the success of this will inevitably destroy the very quality on which its success depends – poverty. Hopefully, future forums will be able to work through this contradiction. At the very theatrical conclusion of the forum, the Minister for Foreign Affairs Franco Frattini joined his Italian colleagues in offering the sumptuous building of Villa Real as the permanent site for the UNESCO forum, which would become an annual event. The UNESCO World Forum on Culture and Cultural Industries faces the challenge of finding a place for itself amongst a number of similar global platforms, such as the recent World Summit on Arts and Culture in Johannesburg. 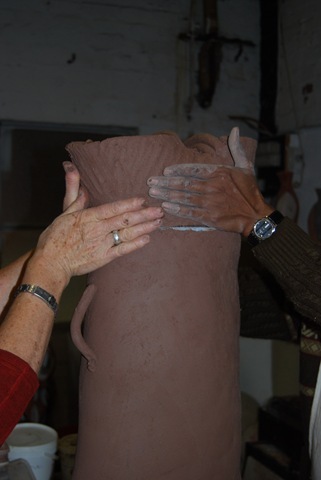 The forum touches a sensitive nerve in the status of world crafts. It resonates with the current consensus that heritage is a living process that must be able to respond to modernity. The support of rich consumers is a real alternative. I think there’s an argument for the benefits of such patronage in supporting excellence and diversity in crafts, especially in the land of the Medicis. But there are also real issues in the breadth and sustainability of those benefits. So might this debate proceed? In my next post I’ll mention what to me were some of the productive threads of discussion that emerged at Monza. 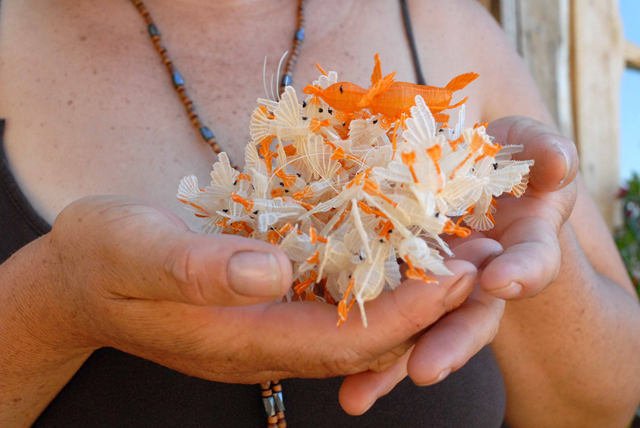 Crin is one of Chile’s most distinctive folk crafts. In markets around the country you will find delicate forms, often taking the shape of insects, woven out of dyed horsehair. Despite its distribution around the country, almost all Crin originates from a small town called Rari. Crin appeared mysteriously around 200 years ago, as local women found they could weave poplar roots into figures. After discovering the flexibility of horse hair they combined a Mexican plant fibre Ixtle which provided structural strength. It’s not clear why this technique emerged there in particular, but the town’s proximity to a spa resort meant that there was a ready market for cositas (little things). Crin is made entirely by hand. No equipment is involved, even knitting needles. But unlike the chunky results of finger-knitting, crin is exquisitely fine. As a folk craft, crin was rarely taken seriously. However, it is now finding a niche as a versatile, colourful and particularly Chilean component in the burgeoning new jewellery scene in Chile. But its recent success comes with complications. 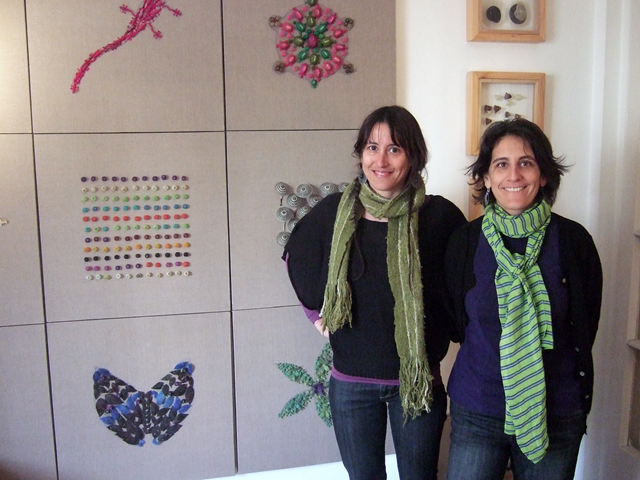 A Santiago architect Paula Leal has been exploring ways of collaborating with artisans from Rari. An earlier attempt with weaver Alba Sepúlveda led to the award for the 2008 UNESCO Seal of Excellence for Handicraft Products. 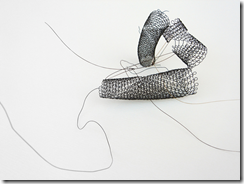 The product incorporated modernist forms of crin into a hair clasp. But the business of incorporating crin into jewellery is actually quite a political issue. In some ways, it parallels the movement of New Zealand jewellers who sought to include local materials and techniques such as jade carving into their work. In some cases, this meant reviving some of the lost Indigenous skills, while at the same time not simply imitating traditional Maori culture. In the case of Chile, it is still the case that you can’t incorporate crin into your work without the willing cooperation of an artisan. It seems the nature of Chilean society that local skills are not easily generalisable. 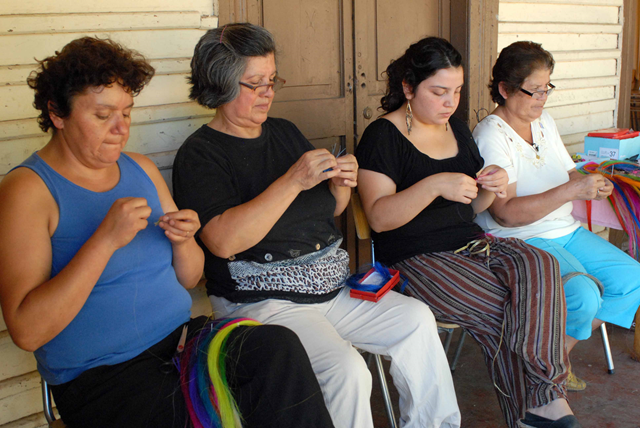 It would be extremely rare for someone in Santiago to teach themselves how to weave with crin. This division of labour creates an asymmetry, particular in the relative prices of crin sold in markets and jewellery featuring crin in fashionable jewellery boutiques. Even for someone who has achieved success such as Paula, this can be difficult. She had to find some new crin weavers when her previous collaborator broke the partnership. Apparently, she felt resentment that she was sharing the stage with a designer who didn’t actually make anything herself. Recently, Paula Leal formed a partnership with fellow architect Manuela Tromben in the development of an exhibition devoted to crin. Orígenes Y Atuendos Imaginarios (Origins and Imaginary Outfits) included jewellery and wall work that manipulated elements of traditional crin to create new works. For instance, the cylindrical form that normally is coiled to form the body of a snail was uncoiled and introduced into a necklace form. Local jewellers Walka Studio added the silver attachments. Crin has a long way to go. There’s potential for much experimentation. It seems inevitable that someone in Santiago will eventually learn to make it themselves. But I hope that doesn’t exclude the possibility that some of the women from Rari might themselves engage actively with product development. But here, on the other side of the Pacific, a recent exhibition in Melbourne shows an alternative path. Vicky Shukuroglou recently completed her Masters in Gold and Silversmithing. Vicky had previously taken a South Project residency in Brazil and was interested in weaving with alternative materials. 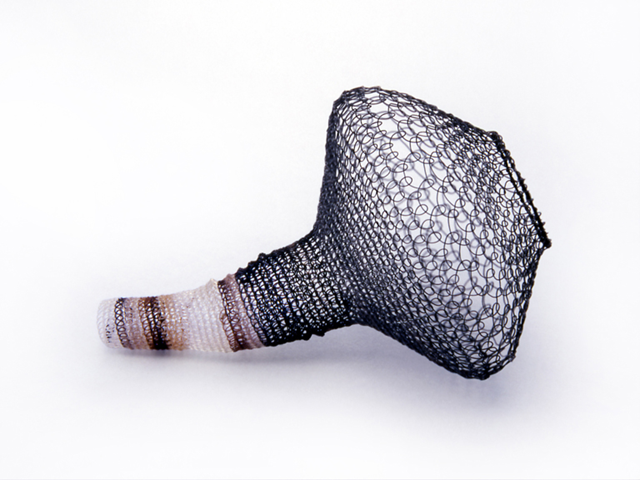 While at RMIT she had furthered her manipulation of horse hair to create extremely delicate woven structures. Vicky’s objects are designed deliberately to appear insubstantial. They certainly are not made to function as jewellery, lacking solid form and metal clasps. But as such, they might seem to be true to the wispy material itself, allowing it to unravel freely. Some are likely to worry that she is taking the object out of the normal circuits of exchange that connect it with people’s lives – it can only live on a plinth. Is this a possible path in Chile? In all, what’s happening with crin tells a story similar to other crafts across the South. Part of the post-colonial process involves coming to terms with the immediate world around us. This means not always looking North for what’s precious, but learning in how to find the beauty in what is at hand. That process has barely begun. Like most other colonies, the nation of Chile was established through a forced dispossession of Indigenous peoples from their land. One group proved particularly hard to displace. Prior to the arrival of the Spanish, the Mapuche had successful resisted an invasion from the Incas. After this, they held off the Spanish for nearly 300 years, as colonists appropriated land to their north and south. The middle territory of Mapuche ranged from Concepción in the north to Chiloé in the south. Today, Mapuche make up 4% of the population in Chile. Their centre is Temuco, a city of a quarter of a million people, now a tourist hub. In the region of Temuco are many Mapuche communities, which are mostly poor and subsist on crafts and agricultural production. The crafts of weaving and jewellery are particularly strong among Mapuche. In Chile, they are known as well for their herbal medicines and elaborate cosmography, based on the cardinal points. The World Vision office in Temuco is focused on enabling Mapuche communities to have greater independence and capacity. In July this year, I travelled with Alejandra Bobadilla to communities west of Temuco, towards Puetro Saavedra. 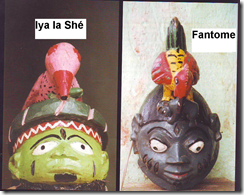 These were people known as lafkenche, people of the sea. 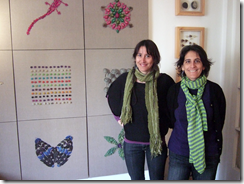 Alejandra’s main mission was to encourage handmade textile production among the Mapuche women. We were accompanied by a Mapuche elder, Maria Mallafil, whose familiarity with the communities and understanding of their craft was essential. We mostly met in community halls. These were small rooms with walls covered by notices and posters of common concern. We were offered tortillas and cakes with tea, sometimes matte. For more remote artisans, we would visit their homes. Both women gave feedback on their weaving and suggested new opportunities. In particular, Alejandra had samples from a Colombian designer for vests which were likely to be popular in the urban markets. She showed these designs and discussed how they might be produced. Along the way, she also dealt with issues ranging from health to agriculture. It seemed she was a very important conduit for information between the communities. I was particularly struck by the visit to Helena Mallefil, a basket-maker. She had a particularly humble one-room house, with no glass in the windows, but with a very cosy tray of coals to keep us warm. She make a wonderful orange cake and tea. 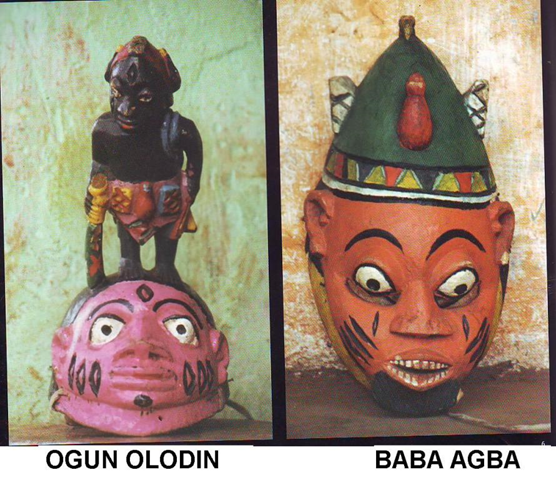 Looking around at her baskets, I realised that I had purchased one of them last year at ONA as a gift for my mother. As often, I thought of the distance between her seeming threadbare life and the comfortable clientele of ONA in Santiago. Her baskets are strong, well-made and beautifully coloured with natural dyes. 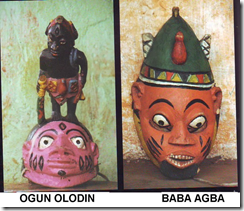 But I noticed one round basket in particular which was adorned with a head, wings and feet. It seemed like a penguin, but it was probably a hen (for putting eggs in). I could see great potential here, following what has happened with Aboriginal basket-makers in Australia’s Western desert, who now produce lively grass sculptures. Back in Santiago, Alejandra took me to visit the shop in downtown Providencia (rich suburb of Santiago) where much of the Mapuche textiles are sold. It was a very nice shop, with a wide range of craft products, particularly jewellery. But I thought it was a shame that there wasn’t an outlet that might tell a Mapuche story more completely. I could see it would also make a difference if the designers were able to spend time directly with Mapuche in developing and producing new works. World Vision do have a broad view of possibilities for Mapuche. They are currently working on a cultural exchange between Mapuche and Australian Indigenous. The facilities offered for Indigenous culture here, such as the Koorie Heritage Trust, may well be the subject of envy on the other side of the Pacific. But the resilience and pride of the Mapuche could be inspiring here too. The Mapuche have a particularly rich musical, poetic and craft culture. Colonisation has seen them pushed to the margins of Chilean society. It seems a worthwhile challenge to find ways of bridging that divide. I’ve recently taken up an honorary position as Adjunct Professor at RMIT University in the School of Art. On Wednesday night, I was asked to give a keynote in that capacity at a symposium entitled ‘Art & Globalization: Urban Futures and Aesthetic Relations’, organised in association with the Global Cities Research Institute. The lecture came at the end of a fascinating day—the breadth of papers showing the advantage of the college system at RMIT which enables dialogue between fields such as visual arts, architecture and landscape design. My paper followed a number that reviewed the field of public art in response to growing democratisation. The very animated discussion at the end was particularly significant, and deserves reflection here. My paper presented many of the cases featured in Craft Unbound within the context of visual arts. While product development is usually seen as a combination of craft and design, it is increasingly found now in symbolic spaces such as an art galleries. In modernism, the boundaries that separate art from life are continually tested—from Duchamp’s readymade to more recent relational art that turns an art gallery into a restaurant. In recent times, such boundaries have been seen as increasingly political, particularly the divide between Global South and North that underpins the economic basis of the art world. When we view such work, we not only judge it according to how it pleases us, but also the meaning it seems to have for those involved. Such work can forge new relationships that test our preconceptions about the possible relationships between North and South. Danius Kesminas’ Punkasila project, for example, provides an alternative to the conventional path of Western artist who seeks to honour pre-modern traditions. Something as foreign as punk music may be seen to engage local Indonesians in a high-spirited collaboration. Whether we approve of that, or not, it gives us an alternative path to consider. Art gives us this space to experiment. 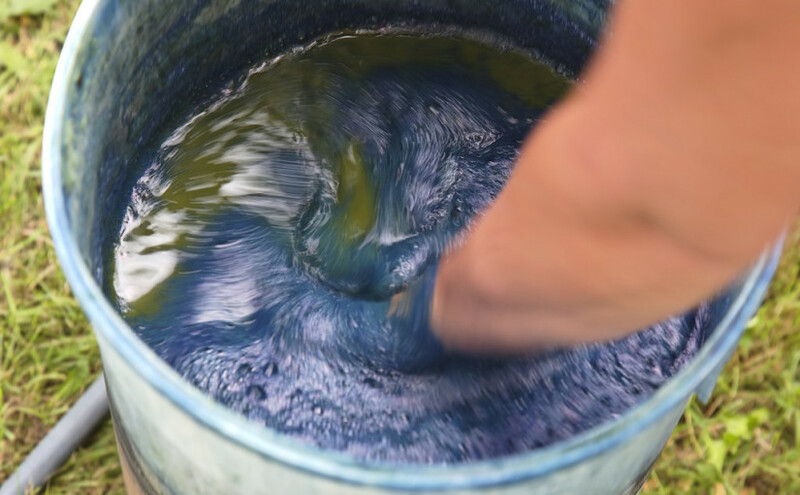 Some of the discussion that followed the paper expressed scepticism that an Australian artist working with a traditional artisan could ever be in the interests of both. An alternative strategy was raised in the work of Spanish artist Santiago Sierra, who exposes power relations through spectacles of humiliation where, for instance, he pays workers to move a heavy rock between A and B without reason. For some, such work is seen as more honest about the power relations—it calls a spade a spade. This debate was important. It was a rare opportunity to air this scepticism in a public forum. My response was that we need to question our tendency to assume that art which involves the Global South must exclusively be a matter of revealing injustice. This is certainly not to deny that such injustice exists, but to allow for a point of view from the other side that does not want to play the role of victim. This is to assume that an artisan, or artist, might want the opportunity to create new works, get to know a foreigner and earn some money. This reflects the new confident voices from the Global South emerging around the Kyoto Protocol. So how can we be sure that such collaborations have meaning for both parties? What stops such collaborations being used to gloss over real inequities? In the case of coffee, we have the Fair Trade label to give us confidence that our purchase does good. It would seem very important now to engage in research that found meaningful ways of reflecting the points of view of all involved. This is what’s currently in development with the Code of Practice for Craft-Design Collaborations. The discussion revealed the very important role that an institution like RMIT can play as an academic forum in which to critically discuss trends emerging in cultural production. I am grateful to the audience who raised these issues, and hope we can find ways to inform this dialogue in the future. As they say in Laos, ‘If you like things easy, you’ll have difficulties; if you like problems, you’ll succeed’. Speaking about how Chinese do business, two words came into my mind: ‘paradox’ and ‘duality’. A paradox is a contradiction or a situation that is not in line with our common sense. In fact, just a few days ago, I happened to experience such paradoxical situation, which might give you a bit of glimpse into how Chinese do business. [Dr Zheng related a story about visiting a shop in Springvale to be offered a special ‘Chinese price’ much lower than that offered to non-Chinese]. While a paradox is a situation one encounters passively, a duality tends to be a choice or response one actively makes. Indeed, the Chinese shop owner would have to have dualistic response to different customers every day instead of being consistent as most people in the West would do….. Different to the Western’s thinking which is quite linear, time sequential, logical and analytical, Chinese thinking is correlative, non-linear, more holistic and in many ways appears illogical. So it is comfortable for Chinese to see that ‘yin’ and ‘yang’ co-exist. 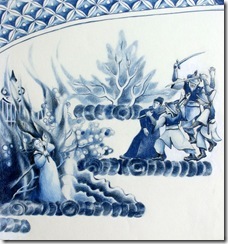 Crisis as expressed in Chinese word (wei ji) in fact represents not just threat but also opportunity. ‘Black’ and ‘white’ must be together to see things clearly. Chinese knows well that things are made of ‘East’ and ‘West’ (dong xi) and if anyone who act inhumanly, they are called ‘things’ neither from east nor west. Indeed any ‘contradiction’ is fine so long you have ‘spear’ and ‘shield’ which are the exact Chinese words (mou dun) for contradiction and paradox. So you see, in the world largest socialist and communist country, free market thrives yet social service and welfare mostly lacks. Chinese business people are more relaxed when responding to these types of paradox than their western counterparts as paradox and duality are really part of their daily life. This is not to say that they like this type of life with lots of contradictions. In fact, for the very reason of their dislike, Chinese has developed, over centuries, certain rules of social and business dealings which help guide them to weave through this complex social and economic fabric. 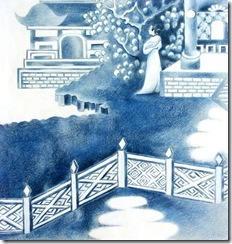 First of the utmost business principle is trust – Chinese words are cheng xing – sincerity and trust. Trust reduces the level of uncertainty caused by paradoxes. Without trust in their counterparts, it would be very difficult to even get Chinese to talk about any business. The second principle is reciprocity. This is really the follow-up step to further reinforce trust between business parties. Gift-giving, sharing meals not going by Dutch but by taking turn to pay bills as a way to express this type of reciprocity. The third principle is that of building strong relationship – guanxi as most of us probably all have heard of. Guanxi networks not only facilitate close circle business dealing, but also build almost a very strong ‘word of mouth’ marketing strategies without spending a cent on advertisement. The fourth principle is to do with business operation within the in-group. I have earlier mentioned about how Chinese always think that they are doing things differently from the outgroup. To Chinese, in-group is easy to build trust. In-group when combined with patriotism can be quite scary sometimes in business dealing. For example, how Chinese respond to the collapse of deal with Rio Tinto [response from China to Australia’s anxiety about losing influence is to say that Rio is already a foreign-owned company anyway]. In-group business operation acts as a buttress to protect Chinese own business interests whilst saving face from having to explain paradoxical situations which only Chinese can understand. The last but not the least principle is to ensure the close tie to certain higher bodies – so called having a hat to protect business interest. Hats are color-coded, ‘Red’ for the communist party and its associated agencies, ‘Green’ for the army, ‘White’ for foreign companies. Every Chinese business man and woman would need to spend substantial amount of time and resources to search and find these hats, and constantly please and play with these hats, especially the red and green hats. For pragmatic Chinese, white hat is very useful as it can blend with other hats and create new kinds of colour hats which are useful for business, so foreigners are definitely most welcome in China in terms of doing business. With many paradoxes, dualities and rules only in-group Chinese can understand, how could we, Australians build a link and break into the art industry in China? In fact, I do not have answer. But I believe that the art works can truly be used as a form to build the global link. For most of us, a fascinating piece of artwork can take our breath away so the differences in thinking and mindsets of the person who creates the piece are no longer important. Instead our focus shift to the beauty and meaning of the art itself. In the same way, I believe a true art form can dim down the differences between cultures and peoples and let the true humanity of life, love, peace, joy, compassion and understanding shine. With that note, I take great pleasure to launch this very special issue. The World of Small Things was finally installed at Craft Victoria in time for the opening last night. It was a great crowd that seemed absorbed by the stories of craft and design at the frontier. Professor Soumitri Varadarajan gave a wonderful opening speech. He talked from an India perspective about the way the term ‘developing’ seems now an inappropriate term for what’s happening in his country today. This is particularly the case where India itself has a craft infrastructure and market that is offering so many opportunities for those seeking to develop fine product. What moved the crowd in particular was the way Soumitri drew on the show’s parallel with the Arundhati Roy novel, The God of Small Things. 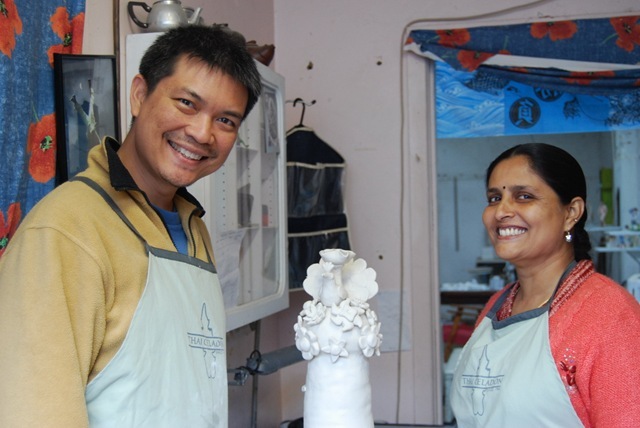 Soumitri spoke about the resilience of craft in extreme conditions, such as poverty and displacement. He considered that this was inevitably part of the human condition. Once all the works had been gathered together in one space, it is quite striking how much these projects reflect the deep changes in our world, particularly urbanisation and the new ethical sensibility. It’s a sign that craft is actively responding to this world, thanks particularly to those who venture forth into its margins. These craft projects entail great risk and personal commitment. Thankfully, they have ‘come up with the goods’.